The Fire industry is historically hesitant to change, and why shouldn’t it be? If it ain’t broke, why fix it? For hundreds of years we’ve put out Class A fires with just plain water. It works. It works well. How are we going to improve on that? There are a lot of companies around the world that are using new technologies to improve fire fighting methods and techniques, and these are worth reviewing to see if they may be appropriate for your department and your community. For those purists, many of these techniques still just use plain water, but in different ways. I agree that for most fires, water is our best tool. Consider some of the new ways to apply water and ask for demonstrations for the additional effectiveness. Photo courtesy of W. S. Darley & Co.
One of the trends in the US, coming out of the military, or more specifically, the US Air Force, is the use of water at Ultra High Pressure (UHP), in many cases over 1300 pounds per square inch (psi)/90 Bar. Systems that can deliver 300 gallons per minute (GPM)/1150 litres per minute (LPM) at 1300 psi/90 Bar have been delivered and tested with excellent results. These systems require extreme power and are not suitable for most commercial chassis in general. Oshkosh Corporation has delivered several vehicles to the US Air Force, and all tests to date have been quite promising. The high speed discharge of such a fire stream is quite remarkable – it literally suppresses the flames by blowing them out, like a breath of air on a candle, except at 1300 psi/90 Bar and including water. This new development has caught the attention of the National Fire Protection Association (NFPA), which has defined such systems in its latest upcoming edition of NFPA 1901. Photo courtesy of W. S Darley & Co.
UHP is also popular on small All Terrain Vehicle (ATV) sized units, where water carrying capacity is always at a premium. Making the most of your on board water supply is always a goal. 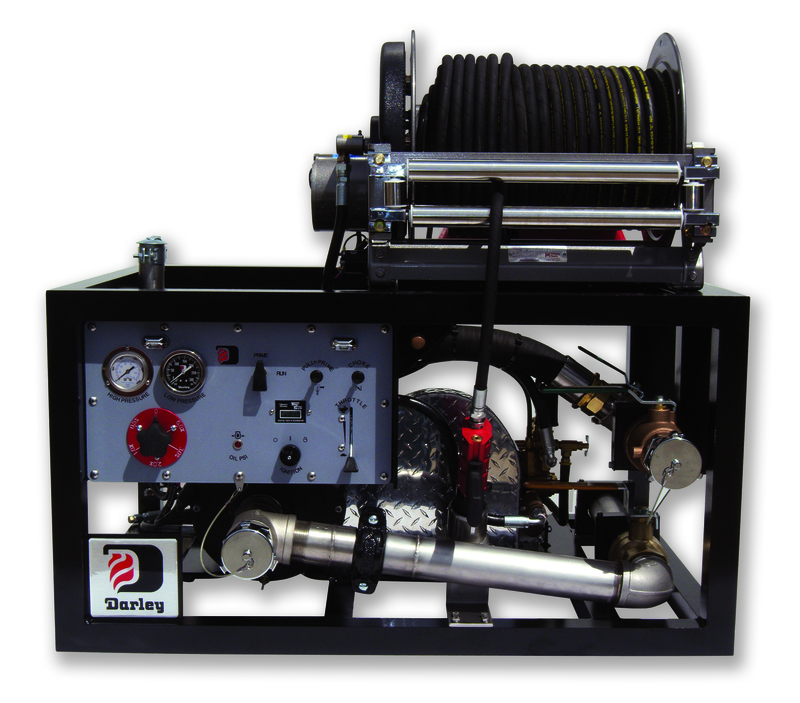 One new product on the market is providing the best of both worlds, providing a UHP system for maximum firefighting duration, along with a higher volume pump to provide quick refills from nearby water sources or the ability to relay water to other vehicles in higher volumes. A local US supplier, E.J Metals, has built a large number of such ATV sized vehicles, which are very popular in wildland settings. 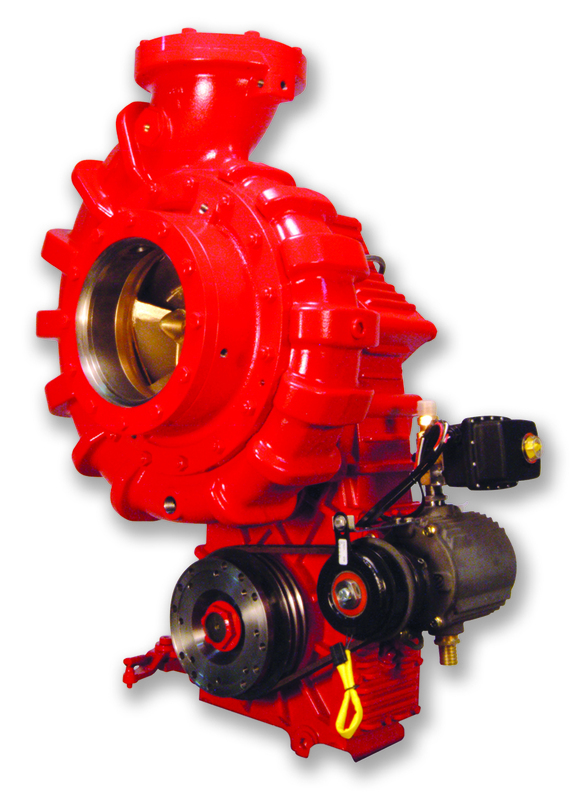 In many parts of the world, there is a competing trend toward very large pumps, sometimes 3500 GPM (13,250 LPM) or more. These are most popular on industrial fire pumpers, such as those protecting petrochemical facilities, and also popular on large fire boats. Some shipbuilders, such as Canadian firm MetalCraft Marine, have built vessels equipped with two such pumps, for a whopping 7000 GPM (26,500 LPM) capacity. While not generally needed on a fire boat, vehicle mounted pumps needed improved priming capabilities. Many of these vehicles require multiple 6” or 8” hose connections when operated from draft, and a conventional 12 volt rotary vane primer is insufficient to prime in an adequate priming time. Using multiple primers is an option, but the electrical loads can become excessive in short order. This has led to the development of belt driven primers of greater capacity that can prime multiple 8” lines in less than 30 seconds. We expect this technology to drift down to smaller capacity pumps as well. 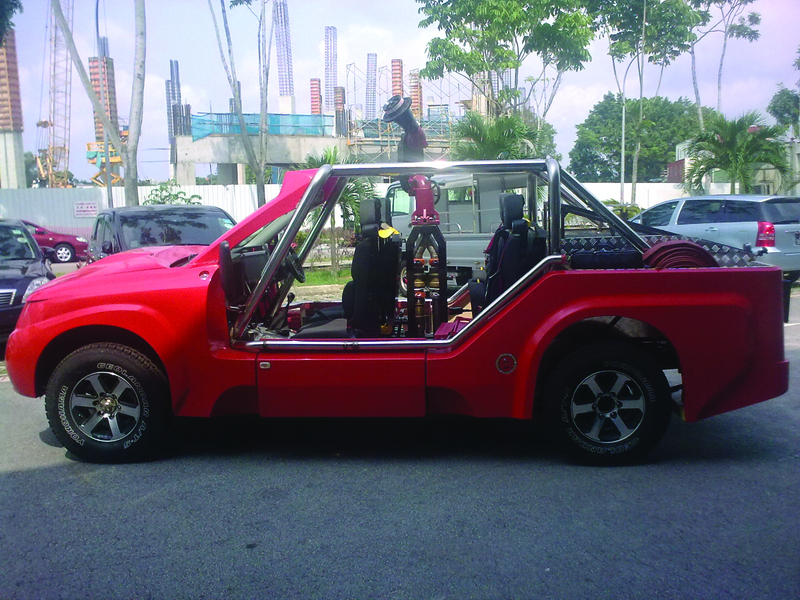 In other parts of the world, the trend seems to be headed toward smaller vehicles. In Singapore, for instance, their Fire Service is embracing what they call the Light Fire Attack Vehicle, more affectionately known as the Red Rhino. These are small, nimble vehicles that can get right close to the action, even on narrow streets. Despite their size, they are equipped with a 500 GPM (2000 LPM) pump and have some Compressed Air Foam (CAF) capacity as well. Their lineup of fire bikes, known as the Red Scorpions, are also equipped with CAF, and as motorcycles, can weave through congested traffic quite easily. Compressed Air Foam (CAF) systems are nothing new, but some of the applications are taking a new direction. Recently, tests in Beijing and Shanghai have shown the effectiveness of these systems in high rise fire fighting. Due to the inherent lightness of its fire stream compared to plain water, it is possible to pump a compressed air foam stream considerably higher than a plain water stream could go, and do it while maintaining relatively low pressures so that standpipe systems are not over pressurised. Testing has been done on buildings as tall as 100 storeys. One trend in the US, that has been commonplace in most other parts of the world for years, is a trend toward using Power Take Off (PTO) driven pumps. Many departments and builders are starting to realise there is a continued de-emphasis on pumping operations. By some reports, only 5% of US fire calls involve actually pumping water, down remarkably from a few decades ago. This is likely due to more emphasis on sprinkler systems, greater use of fire retardant materials, and similar trends, but it is changing the role of the fire truck in many departments. As departments are responding to a greater percentage of medical and rescue calls, the trend has been to have less emphasis on the pump compartment and more emphasis on additional equipment storage. Nowhere has this been more evident than on recent vehicle designs by such builders as Pierce, Crimson, and Emergency-One, who in recent years, came out with new designs that emphasised equipment storage capacity. To do this, they all utilised a PTO driven pump. Unlike rear mounted pumps, popular in much of international markets, they all maintained a more US traditional midship mounting location. They all have reported significant space and weight savings, as well as reaping some of the safety benefits of a PTO drive versus a split-shaft midship style pump. Sprinkler systems are getting a boost in the US as more communities and States are now mandating them on new residential construction. We expect this to expand to more areas of the world. Given that the expertise of a typical homeowner would not be expected to be that of the owner and operator of a commercial property, a few novel solutions have been brought to market. There are systems that can self-test themselves on a regular basis, and alert a homeowner via mobile phone messages the results of such tests. Should the system record a need to deploy, it can contact both the homeowner and the local fire department automatically. We believe the simplicity of operation for such systems will be a big driver toward the average homeowner, who presumably may not want anything more complicated than the thermostat on their boiler. One disturbing trend affecting many fire departments worldwide is the requirement to deal with vehicle emissions. While I think we can all say that having cleaner air and cleaner water are good goals, from what I have seen, some regulations in some countries are moving faster than they are ready for. This has led to trouble, and does not look like it will get better soon. The predominant issue is the type of fuels available in different parts of the world. In the US, we are rapidly approaching the adoption of what is known as Tier 4 Final regulations. For most engine manufacturers, this has required the installation of a Diesel Particulant Filter (DPF) and a Selective Catalytic Reduction (SCR) system. On vehicles, this takes up valuable space, and on skid mounted engine driven units, it can be equally problematic. For overseas customers, this can lead to complications, as a Tier 4 engine cannot burn even low sulfur diesel fuel, but must be fed with ultra-low sulphur fuel, which is not available in all countries, even those that are ramping up requirements for these level of emissions. Needless to say, this is a recipe for disaster. Many engine manufacturers have intentions to maintain offering Tier 3 compliant engines for these areas of the world, but this, at times, results in long lead times and paperwork nightmares. Granted, it is a bigger nightmare to have your after-treatment exhaust components clog up after one tank of fuel, but it is certainly something to be aware of when you order new equipment. Finally, in the material science end of things, it keeps getting better. As the trend for more power through smaller pumps has continued, the usage of what used to be exotic alloys in both stainless steels and bronzes has kept pace. Many of our pumps now utilise precipitation hardened stainless steel for their pump shafts, and aluminum nickel bronze for their impellers, resulting in stronger splined connections for more resistance to abuse and improper engagements. Several years ago, these materials would have been prohibitively priced for most applications. Hopefully, additional materials become more cost attractive so that all pump manufacturers can offer lighter weights and stronger alloys. I’m still looking forward to eventually designing a pump out of Titanium. With the strength of heat treated steel, the corrosion resistance of 316 stainless steel, and the weight of aluminum – that would be awesome. The downside of course is some multiple of the material cost of Silver and the machinability of hardened Tungsten – it might not happen in my lifetime, but even an engineer can dream!